Books are also available online at Barnes and Noble, Waldenbooks, Books-a-Million and Target. Call the order line at (800) 606-7895, fax your order to (909) 898-4633, or mail your order to Stargazer Publishing, PO Box 77002, Corona, CA 92877-0100. If placing your order by phone, please be ready with a purchase order number, quantity, "bill to" and "ship to" addresses, method of shipping, and your resale number. Also available through Baker & Taylor, Blackwell North America, The Book House, Inc., Book Wholesalers, Inc., Brodart Co., Ingram, and Midwest Library Service. 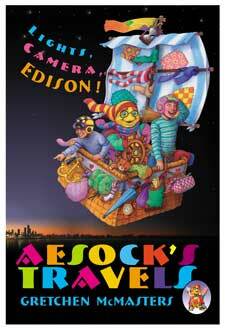 Aesock's Travels: Lights, Camera, Edison! Los Viajes de Aesock: ¡Luz, Cámara, Edison! Size: 5 ¼" X 7 ½"
Story Summary: Benjamin is devastated when his science project fails in front of his second grade class - but help is on the way from a mysterious creature with an affinity for attracting lost socks: Aesock. Join Benjamin, Olivia and Aesock as they travel back in time to meet Thomas Edison as a seven-year-old boy plagued by a hearing deficit and struggling with self-doubt in school. Lights, Camera, Edison! & ¡Luz, Cámara, Edison! is the first chapter book in the series written primarily for readers ages seven to ten.